Mr. Sontirat Sontijirawong, Deputy Minister of Commerce, long with Mrs. Malee Choklumlerd, Director-General of the Department of International Trade Promotion (DITP), Ministry of Commerce, Mr. Kerati Sermpraphasilp, President of the Thai Furniture Industries Association, and Mr. Pichai Pinitkanchanapun, Vice Chairman of the Thai Furniture Industry Club of the Federation of Thai Industries, presided over the opening ceremony of Thailand International Furniture Fair 2017 (TIFF 2017). The 21st edition of TIFF is held under the theme "ASEAN Smart Living…The Living Beyond”, aiming to promote Thailand as a hub of the ASEAN furniture industry. The event is regarded as the most comprehensive furniture exposition ever been held in Thailand. It features 575 booths from 187 companies showcasing and selling a comprehensive array of high-quality furniture from leading manufacturers. 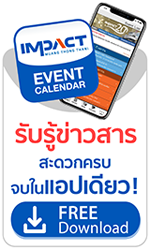 TIFF 2017 is being held during March 8 -12, 2017 at IMPACT Challenger 2, Muang Thong Thani.